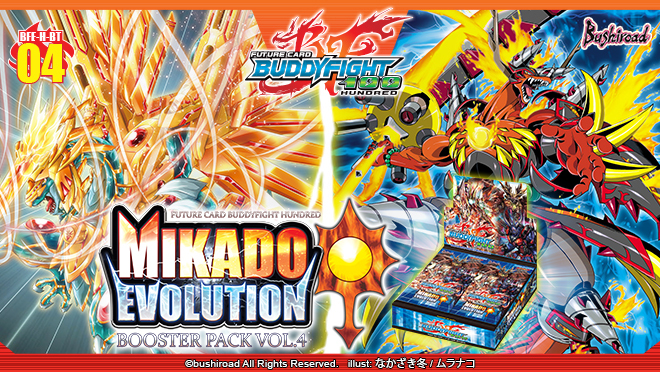 Bring your game to a brand new level with BFE-H-BT04 [Mikado Evolution]!! As the climatic battle against the Hundred Demons begins, get ready for powerful new cards from Dragon World, Danger World, Darkness Dragon World and Star Dragon World! New almighty evolutions of Drum and Jack take to the stage together with the Eighth Omni Lord!! Rise up to defend against the Hundred Demons as this specter of evil continues to devour and rampage in its newly evolved form! Call upon the powers of the future with this set as it features an exciting new SECRET Pack! The future is an extension of the present! Grab hold of your destiny now! 120 types of cards, BR: 1 (Parallel) / SP: 4 (Parallel) / RRR: 8 / RR: 12 / R: 29 / U: 32 (1 reprint) / C: 34 + SECRET: ? 1 card in every pack will definitely be an R or above card! This product contains cards of <Dragon World>, <Danger World>, <Darkness Dragon World> and <Star Dragon World>! 16 types of 《Hundred Demons》 slated to be in this product! Available only in the first print, 1 PR card will be included in every box (4 types)! SECRET Pack will also be randomly distributed! Common, Uncommon and Rare card parallel foils will also be inserted in random packs in addition to the normal rares!